Today we introduce Part Four of our Return to Freeport Pathfinder-compatible PDF adventure series. 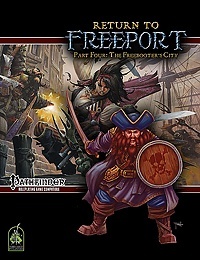 In Return to Freeport, Part Four, the adventurers sail back to Freeport and find themselves embroiled in a different kind of battle, even more dangerous than they are used to: pirate politics. You can buy The Freebooter’s City in our Green Ronin Online Store.